The Alamo in Downtown San Antonio. Photo taken September 29, 2007. San Antonio, the eighth largest city in the United States, has an extensive freeway system. 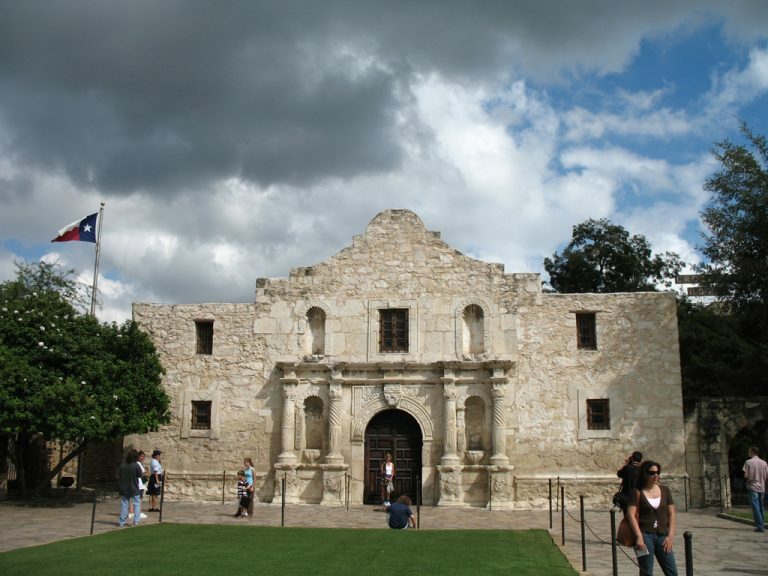 The home of the Alamo, San Antonio is a center for the military, particularly military medicine. The Riverwalk offers unique restaurants and shopping, and Sea World of Texas is located on the west side of the city. Background information on San Antonio freeways will be limited in scope on this guide. For more significant detail on the freeways that are vital to keeping San Antonio mobile, see the San Antonio Freeways at The Texas Highwayman website. Interstate 10 is the oldest freeway in San Antonio. The first section, from Woodlawn Drive to Culebra Avenue (current Spur 421), opened in 1949. An extension south to Martin Street followed in 1951. The section from Fredricksburg Road north of present-day Loop 345 to IH 410 was open by 1962, with the gap between Loop 410 and Woodlawn Avenue completed by 1964. East from Loop 13, construction was finished by 1963, with the freeway extended west to Commerce Street by 1964. By 1968, IH 10 was complete inside Bexar County. The Downtown Y project added a second level to IH 10 between Hildebrand Street and IH 35 over the original 1949-51 freeway during the 1984-90 time frame. US 87 overlaps with IH 10 for the majority of its run through San Antonio. US 90 runs concurrently with IH 10 east from IH 35, south of Downtown. Interstate 35 crosses the city of San Antonio from southwest to northeast. The first section of the freeway, from S. Alamo Street to Nogalitos, was constructed in 1951 with a short double-deck section added over Alamo Street in 1992. The section from Alamo Street to Broadway (crossing IH 10) was completed in 1957. The segment from Broadway to Artesia Road (SBC Parkway) was opened to traffic by 1961. The remainder of the freeway inside Loop 1604 was done by 1964. The section of IH 35 between IH 10 and IH 37 north of Downtown was double decked by 1991. Interstate 37 enters San Antonio on the southeast side by Victor Braunig Lake, and ends by Downtown at IH 35. The first section, from Loop 1604 to Flores Street, opened in 1969, followed by the section between Florida Street and IH 35 in 1971. During Hemisfair 68, a portion of the IH 37 right of way was used to park cars for the Worlds Fair. U.S. 281 overlaps with IH 37 northward from IH 410 to IH 35 and the McAllister Freeway. IH 37 replaced the northernmost portion of U.S. 181. Interstate 410 forms a loop around San Antonio. The freeway replaced Loop 13, which encircled the city along an arterial route. The northwest quadrant of the IH 410 beltway directly upgraded the original Loop 13 roadway. The northwest section, from U.S. 90 to IH 10, was constructed between 1959 and 1960. Between IH 35 and Roosevelt Avenue (Spur 536, former U.S. 281), the freeway was completed by 1964. The rest of the belt route was done by 1967, however the segment between IH 10 and IH 35 on the north side was signed as State Loop 410. This final gap was added to the Interstate system in 1969. US 90 serves the Westside of San Antonio. The freeway opened in 1967 between Nogalitos and Cupples Street, and was extended in 1968 to Loop 410. East of Downtown, US 90 overlaps with IH 10 through to Seguin. US 281 enters the San Antonio on the south central side as a four lane divided highway by Mitchell Lake. The route overlaps with IH 410 east to IH 37 north to Downtown, bypassing its former alignment along Roosevelt Avenue (Spur 536). North of IH 35, US 281 becomes the McAllister Freeway, which winds through Breckinridge Park to reach IH 410 and San Antonio International Airport (SAT). The freeway extends northward to Loop 1604 and Sonterra Boulevard, with right of way in place to continue it another three miles to Marshall Road. The McAllister Freeway was completed in 1978 to San Antonio International Airport (SAT), and progressively extended north to Loop 1604 between 1988 and 1990. The historic alignment was along Roosevelt Street to Navarro Street, then north along San Pedro Avenue. See the US Highway 281 North page at The Texas Highway Man web site a detailed history about the controversy and construction delays for the McAllister Freeway. SH 151 is a suburban freeway winding northwest from U.S. 90 to Alamo Ranch Parkway at Loop 1604. The frontage roads were first opened in 1987, with the freeway main lanes added beginning in 1996. The road serves westside developments, and most notably Sea World San Antonio. Loop 1604 was created from a number of Farm to Market roads between 1953 and 1969, with the original section designated between US 87 (IH 10 north) and US 281. The road was renumbered Loop 1604 in 1977, retaining the FM number for driver familiarity. Sections on the north side were converted to freeway in 1986-87. Routed through San Antonio since 1939, U.S. 87 overlaps with Interstate 10 from Comfort southeast into Bexar County to Roland Avenue at the Eastern Triangle. There U.S. 87 branches southeast to Rigsby Avenue and its original alignment on surface streets toward Victoria. US 181 is the former main highway to Corpus Christi. Originally ending in Downtown, it was truncated at IH 37 in 1974. Historically, US 181 followed South Presa Street from Alamo Street. SH 16 has traveled through San Antonio since 1939. The original routing traveled southeast along Bandera Road from Helotes, meeting U.S. 87 and traveling to Downtown. The state highway continued south on South Flores Street to U.S. 281. In 1964, SH 16 was truncated at US 87/IH 10 north of Downtown, then rerouted in 1965. The route combines with IH 410 (Exit 13) south from Bandera Road in Leon Valley to Palo Alto Road (Exit 49). Quite possibly the busiest arterial in San Antonio, Military Drive is a visual assault of strip malls and retailers. Loop 13 was first designated in 1939, and steadily expanded over the years to become a full loop of the city until IH 410 was designated. The north half of Loop 13 eventually became a part of IH 410. The remainder of the loop today travels south from U.S. 90 through Lackland Air Force Base and east to Brooks City Base and the Highlands community in southeast San Antonio along Military Drive. The north-south leg follows W.W. White Road through the Eastern Triangle to IH 410. Spur 122 is the former alignment of US 181 between Loop 13 (SE Military Drive) and present-day US 181. Spur 122 was created in 1974 with the truncation of US 181 at IH 37 (Exit 132). Loop 345 is a former alignment of US 87, bypassed in stages between 1949 and 1962 as sections of the US 87/IH 10 freeway were built. The road was redesignated as U.S. 87 Business from 1962 until the early 1990s, when it was renumbered as Loop 345. Loop 353 is a former alignment of US 81, bypassed in 1962. As U.S. 81 shifted onto the IH 35 freeway, the old road was signed as US 81 Business. With the decommissioning of U.S. 81 through San Antonio, the business route was redesignated as Loop 353. Loop 368 is the old alignment of US 81 north of Downtown. This stretch of road was renumbered in 1962 with the completion of IH 35 north, and signed as US 81 Business until US 81 was decommissioned in 1991. Spur 421 is former SH 16 between IH 410 and IH 10. This section of Bandera Road was renumbered in 1965 with the realignment of SH 16 around San Antonio along Interstate 410. Spur 421 overlays Bandera Road southeast to Culebra Road through Near Northwest, San Antonio. Spur 422 was created in 1965 as part of the realignment of SH 16 onto the Loop 410. Spur 422 is the short section of former SH 346 (folded into SH 16) leading north from IH 410 and Palo Alto Road to IH 35 in southwest San Antonio. Despite the name, Poteet Jourdanton Freeway constitutes an at-grade expressway. Spur 536 is former US 281 south of Downtown San Antonio. This road was renumbered in 1978 with the completion of the McAllister Freeway and subsequent realignment of US 281 east along IH 410 and north on IH 37 to Downtown. Roosevelt Avenue remains a busy arterial street. Spur 537 was a 1.548 mile long connector between IH 410 and US 281 through North Central San Antonio. Removed from the state highway system in 2015, this arterial was part of the old alignment of US 281. With the completion of the systems interchange joining Interstate 410 and the McAllister Freeway, San Pedro Avenue no longer provided part of the connection between the two freeways. Page Updated August 1, 2017.